There are so many wonderful things to say about this cozy and peaceful Mt. Vernon home! This great property is absolutely huge, sitting on approximately 1.3 acres of fertile land. With a barn in the huge backyard, mature fruit and nut trees plus blueberry bushes, this home is already on its way to becoming an amazing find— and that’s just the yard! A sky view of this phenomenal property. Inside, 17711 McLean Rd Mount Vernon, WA 98273 is equipped with an updated farm style kitchen along with an enormous pantry and ample storage space. The five-burner stove and stainless steel appliances give this 1956 home a modern feel. This house has four bedrooms and two baths plus a large den and a bonus room that could be used as an additional bedroom or office. 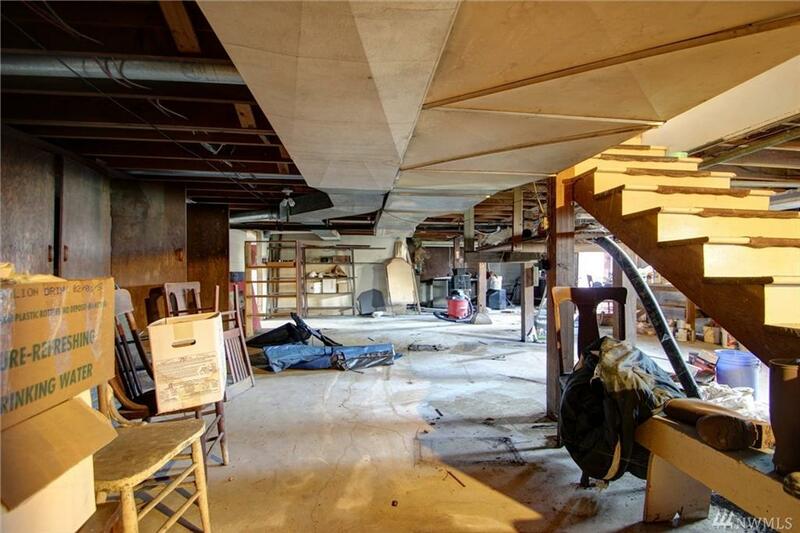 The basement is partially finished and could easily be converted into another section of the house. The two car garage and covered porch are added bonuses to a property that already has so much to offer. Get that country feel while living just minutes to I-5 and downtown Mount Vernon. This house is a must see! Don’t miss the opportunity to see this one of a kind home! Just one of the spacious living areas in this Mount Vernon home. Buying a home does not have to be an overwhelming experience. Team Jean Groesbeck can help you find your perfect home without the stress or hassle. Let us show you the difference that our 5 Star Real Estate Services can make in buying or selling a home. Contact us TODAY if you would like a private showing of this acreage home in Mount Vernon WA or if you would like to see another wonderful home for sale in the Skagit County area. A covered deck is perfect for entertaining in any type of weather! Have you been wishing your home had a view? Well now is a perfect time to trade up to this spectacular townhome! With a huge upstairs deck and views of the Washington State ferry and Puget sound from most of the windows, you can entertain while watching the waves! The covered deck is absolutely perfect for anyone who loves sitting outside during the summer or maybe snuggling up on a lounge chair while drinking a cup of coffee on a cool winter morning. Frameless shower doors, exquisite interior features and a large two car garage make this house just that much more luxurious! If you have ever considered northern Washington, this house is definitely worth your time! Only 90 minutes from Seattle, you also have a boat launch, hiking, biking, the Guemes trail and the ferry to both the San Juan Islands and Victoria, B.C. close by. This beauty is in a quiet neighborhood and because it is a townhome, no yardwork is required from the owner. Never heard of Anacortes? Be prepared to fall in love! This townhome is in the heart of an amazing city known for its small town feel and very active citizens! To learn more about Anacortes, click here! Still not convinced this home is for you? Take a virtual tour or come see it today! This amazing kitchen has granite counter tops! Buying a home can be an overwhelming experience. Team Jean Groesbeck can help you find your perfect home without the stress or hassle. Contact Jean Groesbeck at Jean@JeanGroesbeck.com or 360-941-3734 if you would like to see this home or another wonderful home for sale in the Skagit County area. 1. Professional Experience: Buying or selling a home is likely to be one of the biggest decisions you will make. Even if you have done it before, home regulations, laws, and markets are constantly changing. The average price of a home in the Anacortes area is over $300,000; considering the potential risk, hiring a realtor is a relatively small cost. Would you diagnose a disease without the help of a doctor or file a lawsuit without a lawyer? Think of a realtor in the same way: an expert in the field. 2. Information and Educated Opinions: Again, a realtor is an experienced professional. They can help provide information about zoning, schools, crime in the area and specific information about each property that may not be available to the general public. A professional will look out for your best interest and help you find a home that is perfect for your needs. 3. Selling or Buying Can be a Complicated Process: The process of buying or selling already is overwhelming. Many different factors go into it and that’s not even including the paperwork! Let a professional lead the way and avoid costly mistakes. 4. Skilled Negotiations: Negotiating with the other party is one of the main duties a realtor has. There are many factors that are arranged when selling or buying a home. Those include price, terms, date of possession, financing, repairs and many more. Your agent has the experience you need for getting the best out of what you’re buying. 5. Objectivity: One of the most important attributes of a realtor is that they have absolutely no emotional ties to your home. If you’re selling your house, they can evaluate each buyer’s proposal and resolve any issues without involving feelings about the other party. Are you ready to buy a home in Anacortes, Wa or in Skagit County? Click here to see listings in the area. Visit Anacortesliving.com or email Jean at jean@JeanGroesbeck.com for more information. Guemes Mountain Trail is Now Open! Last Saturday, the Guemes Mountain Trail celebrated its new opening with a ribbon-cutting ceremony followed by a guided tour up the mountain. This trail and the story of how it came about made Guemes Mountain trail one of Washington Trail Associations signature projects of 2011. During fall of 2010, WTA and 175 volunteers began building the new trail to an incredible viewpoint on the mountain. Guemes Mountain is the highest point on Guemes Island and features stunning views of the San Juan Islands, Mount Baker, the North Cascades, and the Skagit flats. The mountain features a unique prairie habitat with a wide variety of flowering flora, small areas of wetlands and maturing forest. The protection of Guemes Mountain has ensured that this scenic location is maintained in a natural state for the public to enjoy. Get out this summer and take a hike to the gorgeous Guemes Mountain! If you’re interested in purchasing or selling a home on Guemes Island, contact one of our agents at 360-293-4511. Fantastic Win by The Coldwell Banker Islanders! Last Thursday, May 12th, The Islanders prevailed and came back during the 6th inning to win their game against Burlington. At the beginning of the game, we’re trailing 1-0 going into the top of the fourth. Pitcher, Shane Brock has pitched 3 solid innings. He starts off the 4th in the same way. He starts off with a walk and then faces six batters in six pitches. They scored 5 runs on 3 hits, one walk and 3 errors (6-0). Flint Rose, head coach of the Islanders put Brennan in in the top of the 5th. He faced 8 batters in the fifth and sixth – no hits, three walks, 4 Ks, no runs. We get a run back in the fifth. It’s 6-1 going into the bottom of the sixth. Isaac lead off with a single and goes to second on a passed ball. Griffin lines one down the 3rd base line. Isaac scores and Griffin takes second on a lazy throw. Colten then slaps one through the hole between short and second. Griffin scores, (6-3). It’s catching on with the players. Shane comes up and hits another one between 3rd and short. Colten had advanced to 2nd on a past ball and now scores from 2nd (6-4). Brennan comes to bat and hits one to the outfield. Shane gets to 3rd and Brennan is at 1st. Jacob comes up. Jacob hits one just over 2nd base. Shane scores and Brennan goes to 2nd. Noah is up. He pops up to 1st baseman. Anthony comes up and hits a grounder through the infield. Brennan tries to go home but gets caught at home plate. Meanwhile, Jacob advances to 3rd and Anthony advance to 2nd. Nick comes up with two outs, two on base, trailing by one, and pokes one over the 1st baseman. Both Jacob and Anthony score. Game over, 7-6 Islanders!!! The boys attitudes and confidence totally transformed as they began to pull ahead of Burlington for the win! Way to go boys! Unfortunately, the Guemes Island Ferry will be out of service from March 28 to May 22, 2011 during the Ferry Dock Rehabilitation Project construction period. Due to many years of exposure to salt water, the docks are in need of a girder replacement. Both Anacortes and Guemesferry docks are suffering from corrosion, cracking, and spalling. The Dock Rehabilitation Project is estimated to last 8-10 weeks total. During this time of construction, a free, passenger-only ferry will be in service from Cap Sante Boat Haven in Anacortes to a temporary floating dock at Guemes Island that is located west of the ferry landing. Parking is also available at Cap Sante Boat Haven and additional long term parking is available at Skagit County’sparking lot (6th Street and K Avenue-Anacortes). A Skagit Transit bus will be available on Guemes to help with transportation needs. A temporary barge service will be provided to deliver garbage, propane, fuel, and grocery services to Guemes Island during this time.